There’s always a big ‘to do’ with Mother’s Day. But on the eve of Father’s Day, I found 3 things you might not know about Father’s Day in Australia. In our household, I’m always extremely looked after on Mother’s Day. I have a thoughtful and loving husband and he makes sure I get spoiled. It’s not to say that I’m gracious about it. No way, I milk it for all it’s worth. “What do you mean you can’t clean your room, Rrrrreally, it’s Mother’s Day in just 3 weeks (sad, disappointed eyes). It’s the one time of the year I can really pull out the Mother card. Sure, it doesn’t always bring out my most redeeming qualities, but it’s only once a year, and I try to maximise the days. My husband, on the other hand, is a little more humble about his special day (Father’s Day). I try each year to do something fun, get the kids involved, make him his special meals or treats, get him just the right gifts. Somehow though, I feel it’s never quite good enough. Just this week, in the lead-up to Father’s Day, he shared that he didn’t think Father’s Day carried the same importance as Mother’s Day does. Personally, I really think he could be doing a better job of maximising it, dropping gift hints prior to, playing the guilt trip more effectively, but hey that’s just me. But seriously, I did feel a bit sad after that. I’d like him to feel like I do on Mother’s Day – Queen for a Day! All of this discussion, of course, lead me to do a bit of research on the topic, and here’s what I found. According to a report, released 2 days ago by the Commonwealth Bank, Australians spend 1.58 billion in the lead up to Father’s Day versus just 1.37 billion spent on Mother’s Day. On average that works out to us spending an extra 15% on Dads. In fact, spending for Father’s Day has increased year-on-year, with the data showing a 37 per cent increase since 2015 in Oz. What’s even more surprising is that the UK reports consumers spent half as much on Dad as they do on Moms for their respective days. 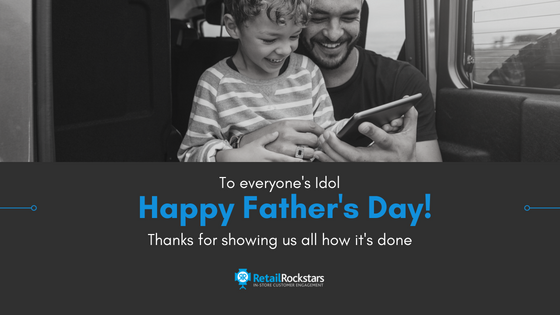 And it doesn’t stop there, the National Retail Federation in the US reported that 23.1billion is spent on Mother’s day with an average gift of around $180, while Father’s Day rolled in at 15.5 billion fetching only $133 on the average US Dad. With my Dad living in the US, I’ve always had a hard time remembering the ‘different dates’ for Fathers Day(s) around the globe. But, did you know that only 4 other countries; New Zealand, Fiji and Papua New Guinea share Father’s Day with us – and it’s because we set the date. Some other 70 other countries celebrate Father’s Day on the 3rd Sunday in June. Why Do We Have Father’s Day In September? There’s a theory for Father’s Day being in September. It’s described as “holiday fatigue” where experts claim consumers grow tired of always being bombarded with holidays and need a little time to recover — a theory that only helps Father’s Day’s September placement. So in essence, like all the other holidays we now celebrate, it was picked for what suited the retailers and promotional calendars best. Father’s Day started in the US in 1910, however, wasn’t celebrated in Australia in 1936, according to an archived newspaper article which lists it as “a new day”. So, while celebrating Mother’s Day in May lines up with most of the world, Father’s Day is a full three months after countries we share the most similarities with. Most if not all of our calendar days, boil down to either marketing or the retail sector. Well, I hope there were some surprises in there for you, there certainly was for me. While my Dad isn’t celebrating Father’s Day tomorrow (he lives in the US, jeez, keep up) – he’s a fantastic guy who served his country in the Vietnam War, worked tirelessly to support our family, was a great teacher and mentor and is still the measuring stick I use to tell whether someone’s a good bloke today. Happy Father’s Day to my husband and all those other Wonderful Dads out there! I hope you have an awesome DAY tomorrow – it’s YOUR Day!